I was adding projects to Ravelry and realized my Thermis never made it to the blog! Here is a not so great pic of the project — and as per my usual, it is not quite done. I still need to stitch on the buttons! 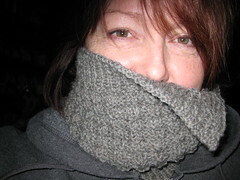 This is a great pattern for a very stylish neck warmer. I used some leftover stash yarn, which always leaves me with a smug feeling of self satisfaction. We leave tomorrow to attend Daughter #1’s college graduation. I simply cannot believe it. When did all this happen? What have I been doing? Wasn’t it just weeks ago that I posted this picture of her freshmen dorm? It’s crazy, isn’t it, this speeding up of time?! I can’t believe it’ been 4 years! Congratulations to the new alum! Congratulations! Daughter #1 on graduating college. congrats ann! time is flying by!! graduation was wonderful. we are so proud of her. thank you for including us on this special day.